Treyarch has announced – during the BO3Fridays live stream – a badge of honor reward for players that have played Call of Duty: Black Ops 2, Call of Duty: Ghosts, or Call of Duty: Advanced Warfare to get a reward in-game in Call of Duty: Black Ops 3 at launch. 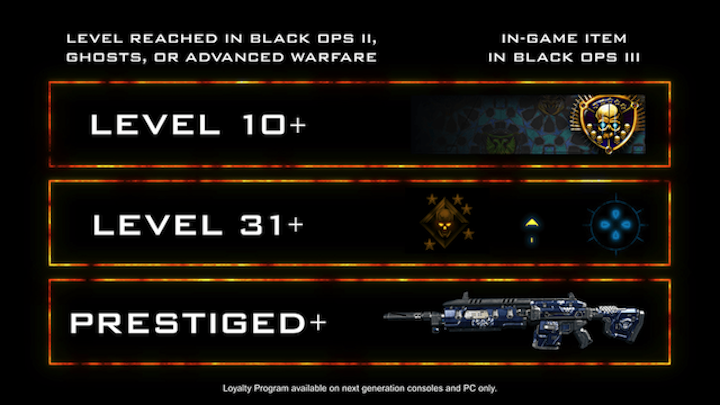 If you reach Level 10+ in any of those games, you will get a Calling Card in Black Ops 3. If you reach level 31+ in any of those games, you will get the Calling Card, as well as a set of reticles for use in Call of Duty: Black Ops 3. If you prestige once in any of those games, you will get the Calling Card, reticles, as well as an exclusive weapon camo for use in Call of Duty: Black Ops 3. Players need to make sure their account [PlayStation Network, Xbox Live, or Steam] is linked to their CallofDuty.com account. These rewards are available only on PlayStation 4, Xbox One, and PC. If you played Call of Duty: Black Ops 2, Call of Duty: Ghosts, or Call of Duty: Advanced Warfare on a different platform than what you plan on playing Call of Duty: Black Ops 3 on, you will still get these rewards, as along as all of your console/PC accounts are linked to the same Call of Duty Account. In addition, it doesn’t matter which game you reach those levels in – as long as you did so in one of them, you’ll get rewarded. 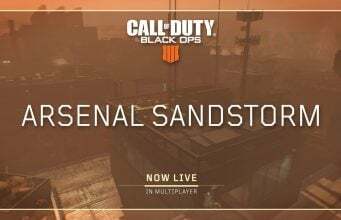 You have until November 5th at 9PM PDT to reach those levels and to make sure your Call of Duty account is linked with either your PSN, Xbox Live, or Steam account. Players must reach target levels in Call of Duty: Black Ops 2, Call of Duty: Ghosts, or Call of Duty: Advanced Warfare by 9:00PM PDT on 11/5/15 on PlayStation 4, PlayStation 3, Xbox One, Xbox 360, or PC. Players must link all their console or Steam accounts to one Call of Duty account by 9:00PM PDT on 11/5/15. 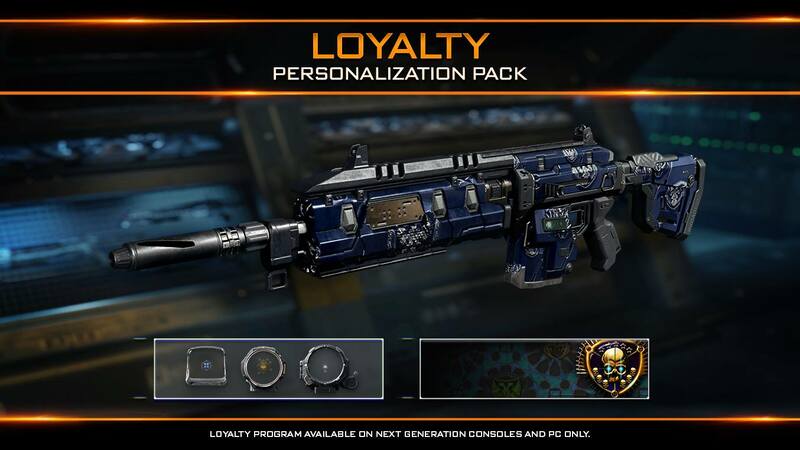 Loyalty rewards are only available in Call of Duty: Black Ops 3 on PlayStation 4, Xbox One, and PC. Loyalty rewards are not available on PlayStation 3 or Xbox 360. 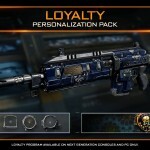 Players must have a copy of Call of Duty: Black Ops 3 to receive the Loyalty rewards. Program may vary by region. Loyalty program subject to change. Read the full FAQ about this program HERE.